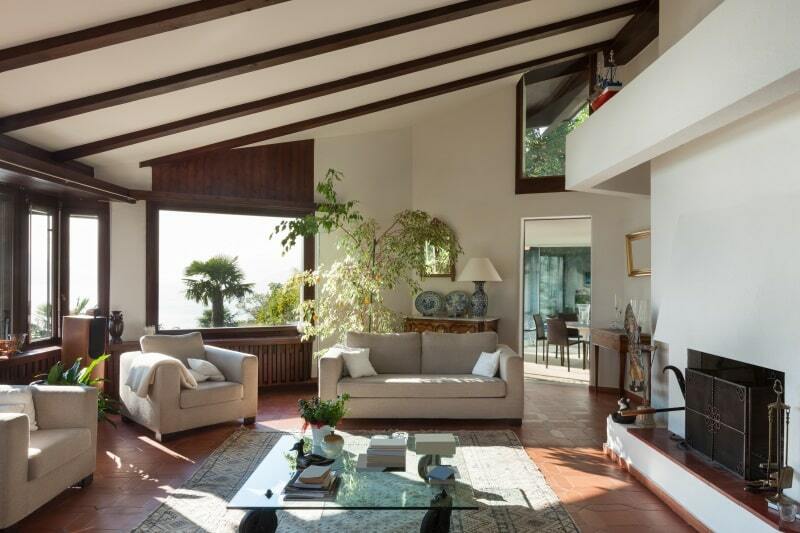 Bonjour and welcome to our gallery of beautiful elegant living room designs…we hope you enjoy them! 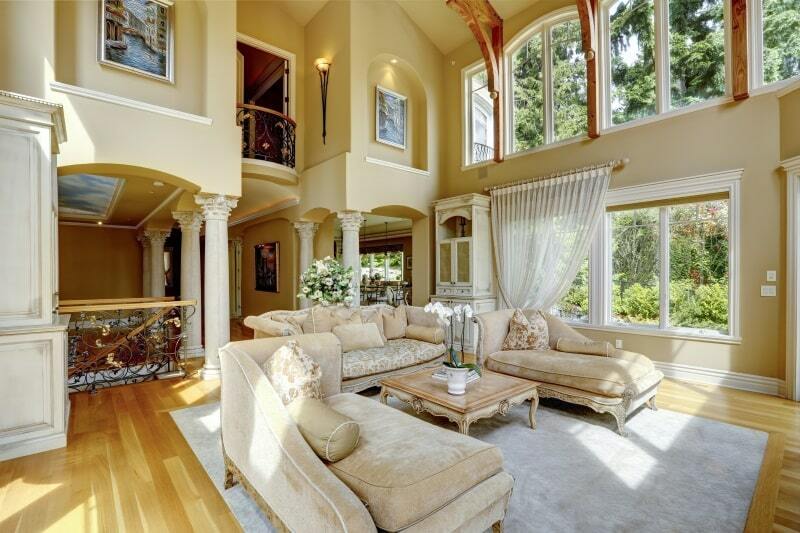 Living rooms come in many different styles and sizes. The heart of your living room beats with the seasons of life. It serves many different purposes depending on the time of day, the season in the year, and where you are in your life. In considering elegant living room designs, remember that no matter how elegant a living room is, it needs to be lived in as well…which is totally compatible as you will notice from the photos of the elegant living room designs we selected for you below. One afternoon your living room is a place to relax quietly with a tea and a book and one evening it is a place to cozy up with the love of your life. On the weekend, it may be buzzing with friends sharing fun and memories with delicious food and wine or on family night, the board game pieces are spread all over the floor. The living room also rhymes with the seasons – on a cold winter afternoon, it may be the warm place where you cuddle up with your grandchildren and re-watch the old cartoons that made their parents laugh out loud. All of these life moments happen in the same room so in thinking about elegant living room designs that may work for you, it’s important to think about the cherished moments you will be sharing in your living room and make sure it will live up to it! So join us and let’s visit with the 21 beautifully elegant living room designs we hand-picked for you. We hope you enjoy them and if it helps you spark one idea to spread love in your own living room, you’ll have made our day…beautiful day to you! 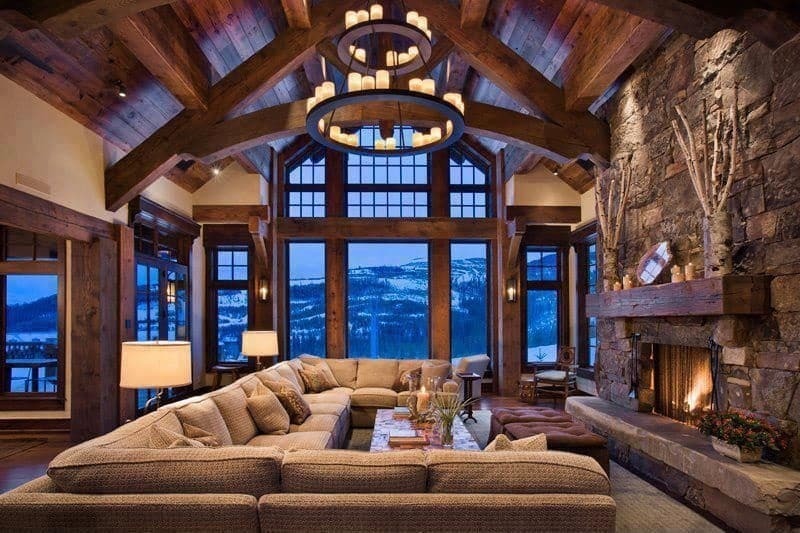 The little Plus: the rustic fireplace and the large u-shaped sofa, perfect to cozy up after a long day in the snow. 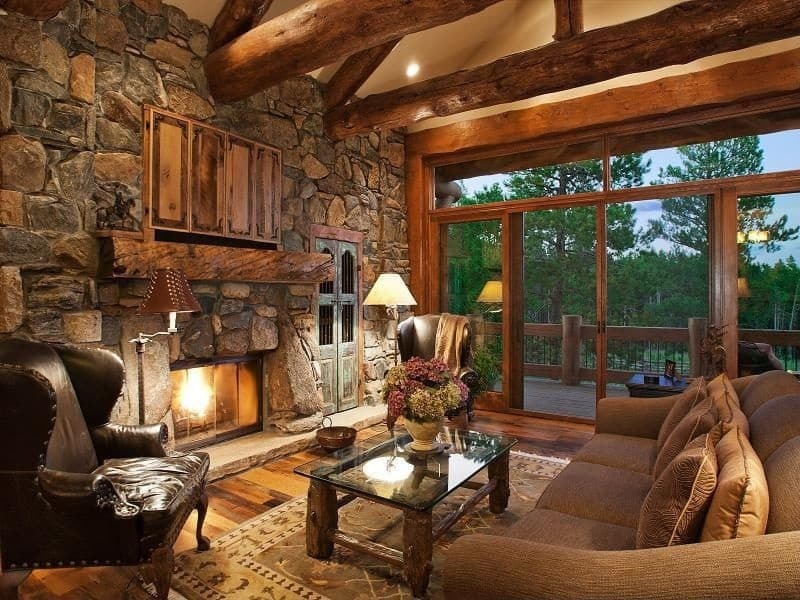 The wall window with rustic beams offers a gorgeous winter in wonderland view and tons of natural light – wow! The little Plus: the friendly living room design with large bay window, terra cotta looking tile floor, fireplace and vaulted ceiling with exposed beams. The little Plus: a lot of elegant living room designs don’t have carpets but in this case the owner wanted their cake and eat it too…so instead of adding a carpet, they framed a carpet area in the center of living room hardwood floor showcasing the two beautiful méridiennes chaise longue (“long chair”). The little Plus: the stone accent wall and its built-in fireplace…definitely the star of the show. 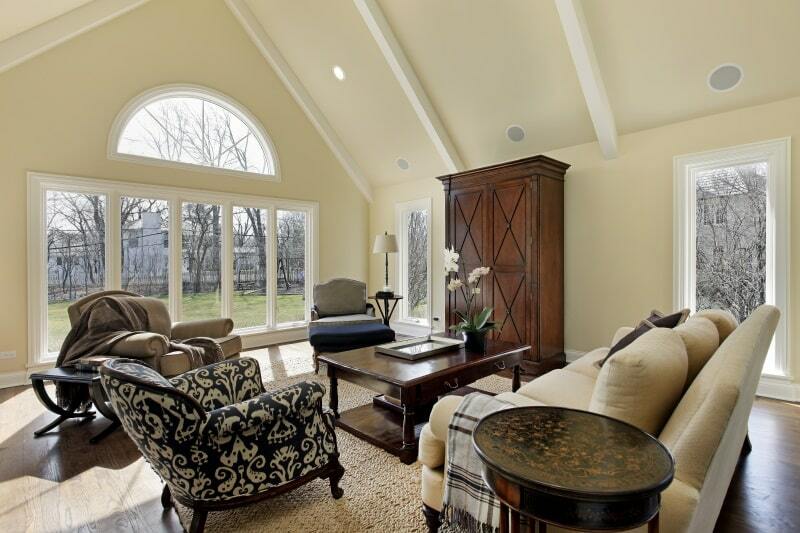 And did you notice how the flat-screen TV is cleverly hidden behind a four-door frame above the mantel? The wall window with French doors is also a great idea to step out on the deck or simply enjoy the view. The little Plus: the cathedral ceiling, several chair designs, large armoire hides TV, moon shape window for added natural light. The little Plus: the hardwood floor living room with large windows for maximum natural light. 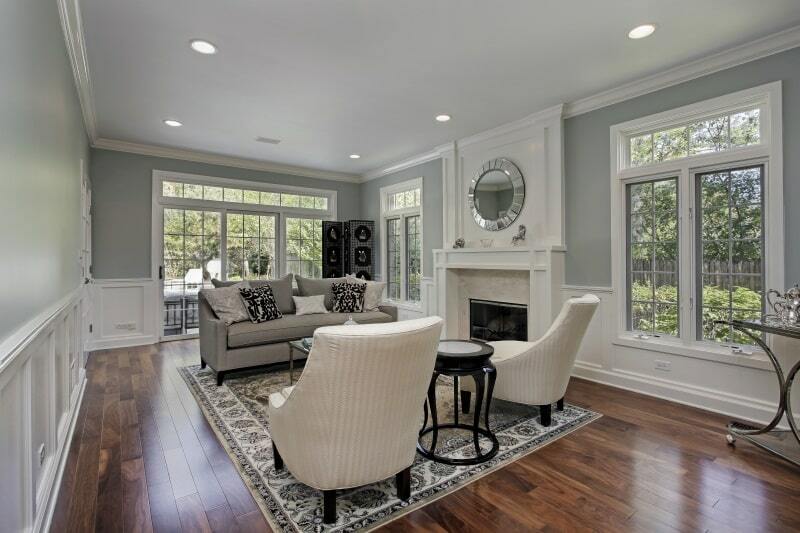 Sofa calls the color of the top wall and white chairs call the fireplace mantel and painted wood panel. The little Plus: the sliding door system for maximum view and fresh air. Two-sided wall mounted fireplace.